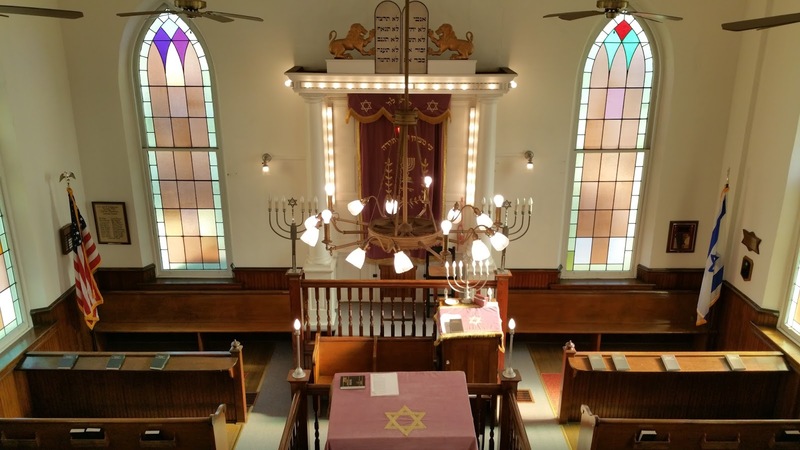 (ISJM) A few months ago I had the pleasure of visiting the B'nai Jacob synagogue in Middleton, Pennsylvania, where the local Penn State University campus is located, just outside Harrisburg. I'd known about this little gem for many years, first from a paper written by Matt Singer relating this building to similar vernacular Gothic synagogues (you can read it here: Jewish-American Gothic Architecture), and also from Julian Preisler, who has been documenting Pennsylvania synagogues for many years. The opportunity to lecture at Penn State Harrisburg gave me a chance to visit - and I was not disappointed. 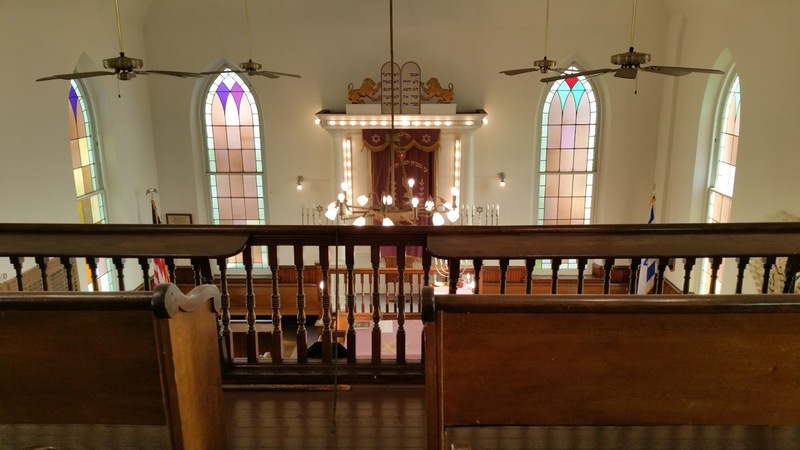 Coincidentally for me (but as pointed out by Singer) the building bears striking formal similarities to the former Ohavi Zedek Synagogue in Burlington, Vermont, and the B'nai Abraham Synagogue of Brenham, Texas, which was recently relocated to Austin (and which will be rededicated on August 30th. These were all Lithuanian-Jewish (Litvak) settlements, and they all seem to have drawn on similar sources and/or been inspired in similar ways by local American vernacular construction. I'm also interested in Middletown's connection to Pusalotas, Lithuania, the town from which most of the Middletown Jewish settlers emigrated ca. 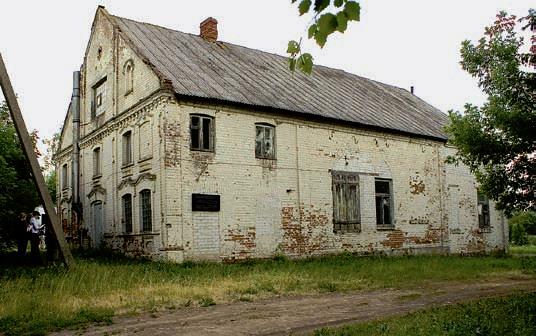 1900, and whose Jewish population was massacred in 1941, but where the former synagogue still stands, and has been returned to the Jewish Community of Lithuania. My new position as a member of the Commission for the Issues Concerning the Jewish History and Culture has me wondering if something more should or could be done there. Services are still held in Middletown once a month (but of course, no more in Pusalotas) and the small B'nai Jacob congregation works hard to maintain the building and its fittings. Three ark curtains have been saved and conserved, and these are hung in protective frames in the social hall downstairs. The congregation is presently raising funds to restore the exterior entrance stairs which are deteriorating, and bowing away from the building. More than half of the estimated $25,000 needs has been raised. I encourage readers to make an online contribution - of any size - via the GoFundMe webpage, here. You can read about the Middletown synagogue here: Historic B'nai Jacob Synagogue, with a detailed description and analysis of the building by Matt Singer here: B'NAI JACOB BUILDING ANALYSIS. B'nai Jacob is a simple but refined one story brick structure, with tall narrow front, side and back windows with pointed arches. It is only becasue of these windows that the synagogues is sometimes referred to as "Gothic" in style. At the rear of the building, one can see a protrusion that represents the Ark, which has been erected to have a depth far greater than the Ark wall thickness. 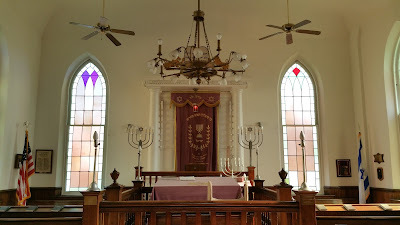 This arrangement is not unknown elsewhere in Europe and America, but neither is it common (I promise to write more about this feature, variations of which can be found in late 19th century synagogues such the former Adas Israel in Washington and in some of the simple synagogues of the agricultural communities of Southern New Jersey (Alliance, Brotmanville, etc.). 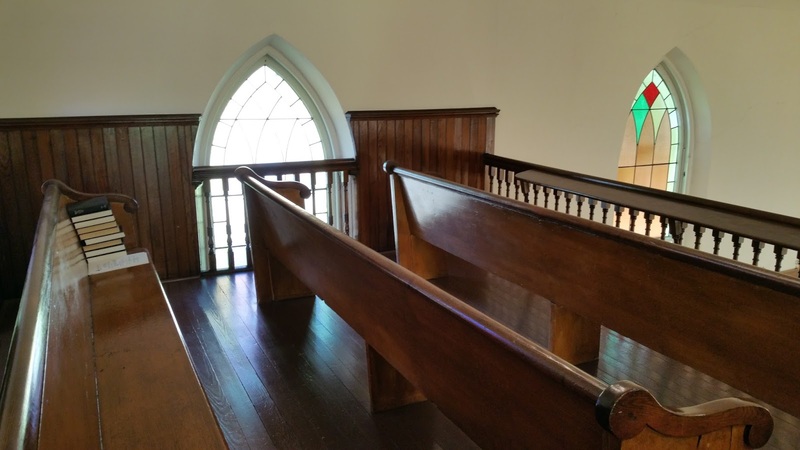 The sanctuary is reached by outside steps and the entire sanctuary is raised on a half story, allowing light into a a full basement used for community space. These exterior stairs, as previously, mentioned, need repair. 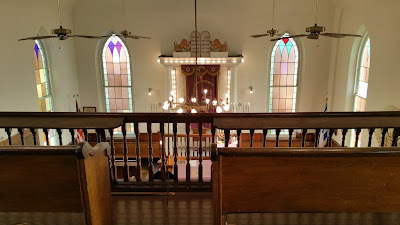 The interior arrangement is traditional, with a central bimah and seating for women in a gallery built above the entrance vestibule, reached by a dogleg stair the opens off the vestibule, before the sanctuary door. The synagogue walls are painted white - but given the colors and decorative patterns we have found in recent years beneath modern whitewash, I wonder of the original appearance wasn't a bit less austere. But certainly the congregation here decided against the richly painted interiors of many contemporary immigrant shuls.The ark employs classical elements combined with the a pair of traditional (East Europe) carved wooden lions supporting a painted Decalogue (Tablets with Ten Commandments) set on top. 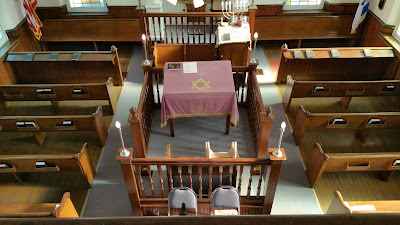 The pews of B'nai Jacob were obtained from an earlier version of the Dauphin County Courthouse. "were, overwhelmingly, Lithuanian Jewish immigrants. Oral lore notes that the founders were not only all, or nearly all, Lithuanian, but were from small, rural villages in the vicinity of the city of Panevezys in north-central Lithuania. Records available through JewishGen, a Jewish genealogy website, confirm this assertion. 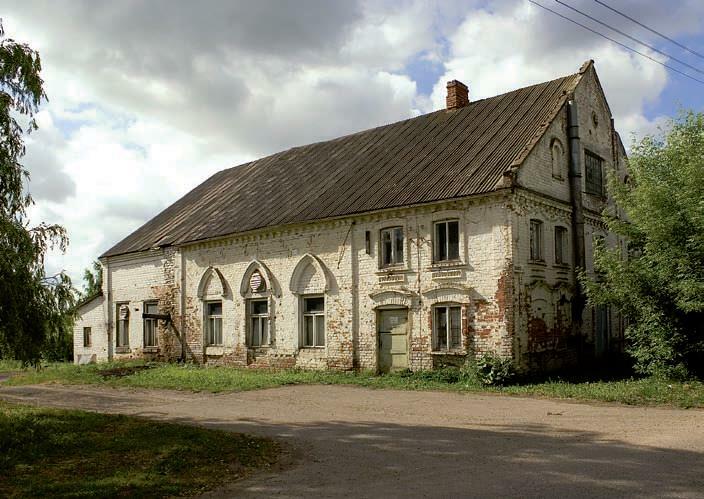 An addendum to the synagogue’s National Register of Historic Places Inventory—Nomination Form (B’nai Jacob was granted historic status in 1985), states that B’nai Jacob’s members were, primarily, from the village of Pusalotas in north-central Lithuania. These Lithuanian Jews were adventurous enough to immigrate to the United States and settle in an obscure, rural town (in these characteristics, of course, Middletown was similar to the villages from which B’nai Jacob’s founders hailed) with a minuscule Jewish community and no Jewish institutions prior to the building of the synagogue. Nonetheless, they maintained traditional Eastern European Orthodox practice, which included living within walking distance of a synagogue, as traditional Jewish law forbids traveling by vehicle on the Sabbath." Pusalotas, Lithuania. Former synagogue, view from northwest. (Photo: Evelina Kazakauskaitė, 2006. SLC Archives) from Synagogues of Lithuania, Vol 2. The main centre of activity was the shul - a solid two-storey brick building which was the heart of the shtetl. This was the new shul that was completed in 1913 after the wooden synagogue burned down. The main hall had two large tiled stoves that were always lit during winter, as it was extremely cold. 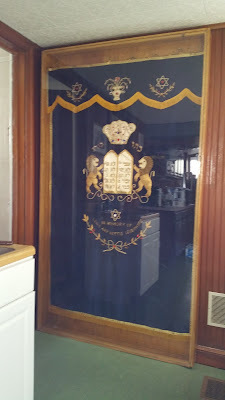 This hall was only used on Shabbat and Yomtov. For daily prayers we used a small room heated in winter with ready-cut wooden logs - there was always a tall stack of them in the open yard - as Lithuania had no coal mines. Prayers were held three times a day and we boys were expected to davven every day, which we duly did. 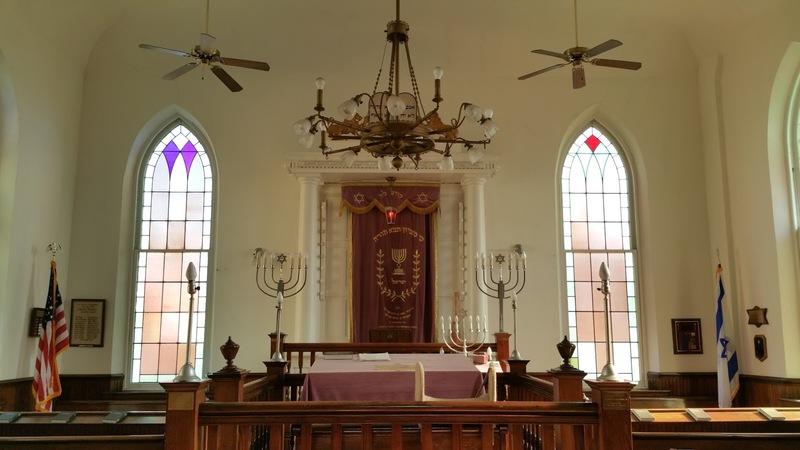 The shul had no toilets, as there was no running water in the shtetl and no indoor plumbing. Most of the exterior of the substantial synagogue remains intact, as can be seen in photos taken in 2006. According to the authors of Synagogues of Lithuania, the synagogue interior was destroyed when the building to industrial purposes after the Holocaust. In the decades since World War II it has housed a dairy, a mill, and then a meat preserving plant. 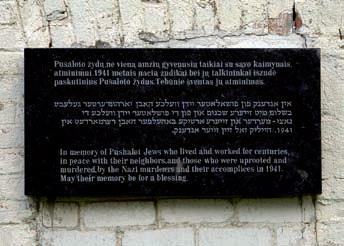 The property was returned to the Lithuanian Jewish Community, and in 2005 a memorial plaque for the victims of the Holocaust was set up on the southern wall of the former synagogue. To my knowledge no plans have been made to renovate or restore the building for any specific Jewish purpose. Pusalotas, Lithuania. Former synagogue, memorial plaque on the southern façade. (Photo: Evelina Kazakauskaitė, 2006. SLC Archives), from Synagogues of Lithuania, Vol 2., p64.